NoMachine can be installed on most flavours of Linux, and that also includes Linux ARM. Those familiar with Linux ARM are probably well read on the different number of tiny sized computers available on the market such as Banana Pi, Beaglebone, Radxa Rock and CuBox TV. These little computers fit in the palm of your hand, yet pack enough power to run as a desktop PC. They can also be used as thin clients, NAS storage devices, a file server and even as a home media server which you might want to access from another room. They are therefore perfect for NoMachine. One of the more popular devices that our users have shown interest in is the Raspberry Pi 2, so we've put together some top tips to get your Raspberry Pi set up for remote control via NoMachine on your home network or over an internet connection. This is really useful if you want to run your Pi as a 'headless' machine without the need for its own monitor, mouse and keyboard - instead you can use your home computer, iPad or Android tablet to access and control your Pi. Or if you want, access it from another Pi! All you need is NoMachine installed on all of the devices you want to use. Raspbian has a graphical interface (GUI) similar to that of Windows or Mac OS X. You can do most of your day-to-day tasks in this interface. Once you've got Rasbian installed, to make sure you get the graphical desktop every time you start up your Raspberry, you'll need to set what happens when your Pi boots. 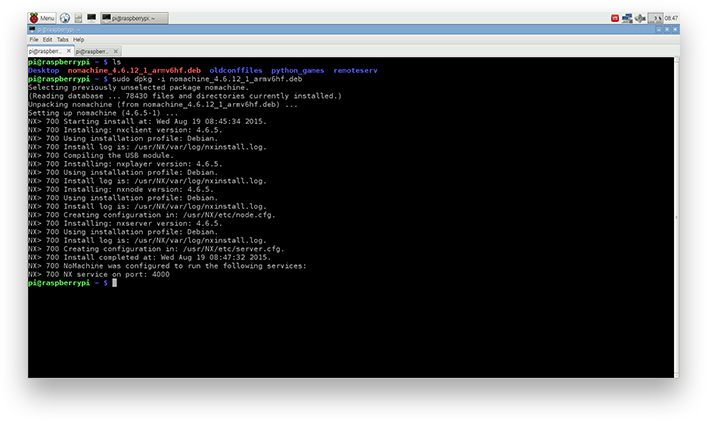 When you first boot in to Raspbian you will be shown the Raspberry Pi configuration tool 'raspi-config. To open the configuration tool after this, simply run 'sudo raspi-config' from the command line using a shell or terminal window (on Raspbian it's called LXTerminal). Enter option 3 - "Enable Boot to Desktop/Scratch". Enter option 2 - "Desktop Log in as user 'pi' at the graphical desktop". So, now you've set up the Raspbian desktop, let's get NoMachine installed. 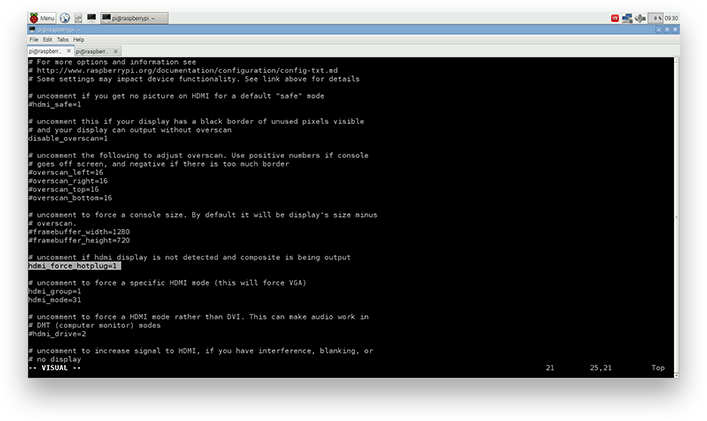 We'll install NoMachine via the command line using LXTerminal. Complete installation (how to update and uninstall) instructions for Linux packages are available at https://www.nomachine.com/DT07M00078#4 . As we hinted at earlier, you can use your Raspberry Pi as either a connecting device or as a computer that you want to remotely access. Now that you've installed NoMachine, you're almost ready. On Raspbian, NoMachine is installed under Internet. 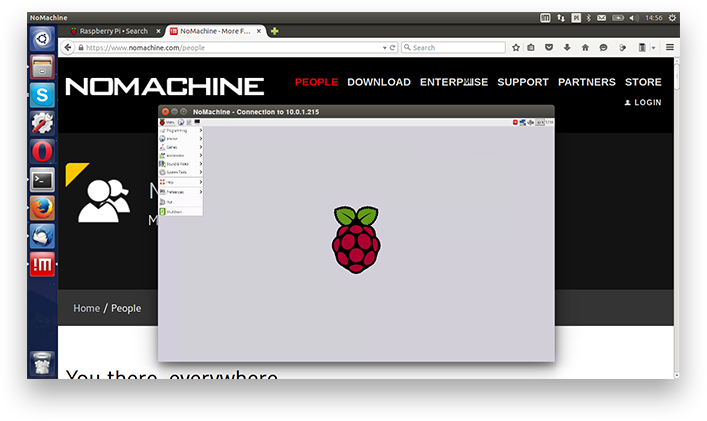 Click on the Raspberry icon menu and navigate to select NoMachine (Fig. 2). The NoMachine User Interface will open. 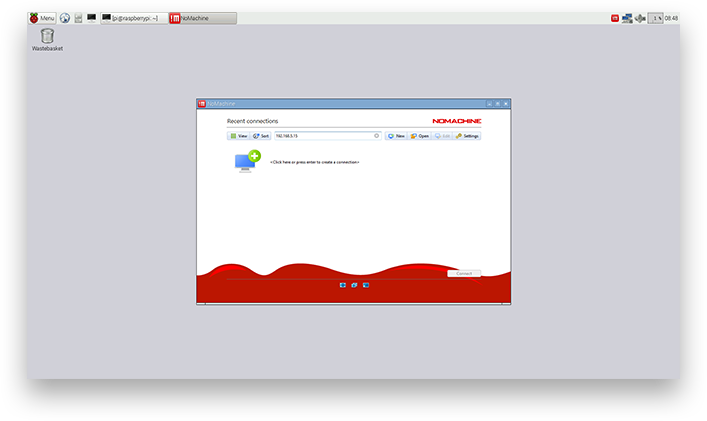 If you've already used NoMachine, you will know that you'll need the IP address of the computer you want to connect to, and you must have previously installed NoMachine there, too. If you are new to NoMachine, you should check out our illustrated tutorial to get started on your first connection. Once you have the IP address of the remote PC or Mac you want to access, you're ready to start using NoMachine on your Raspberry thin client to connect to it. If you are using Raspberry Pi as a server, the sky's your limit to how you use it. By installing the free NoMachine package for Linux ARM, you can remotely control it from wherever you are, work on documents, transfer files back and forth, view videos and games running on it, and much more. You can connect from any Linux, Windows or Mac computer and clients are available for iPad and Android tablets. Select the NoMachine package for your OS from our download section of the website: https://www.nomachine.com/download. The Raspberry Pi is a device that requires additional configuration depending on how you want to use it. The following tips can help you to configure your device, ready to install NoMachine. Locate and uncomment (remove the hash in front of the line) the following lines and enter the desired value. E.g. For a list of all supported modes and groups refer to the Raspberry website. Since our monitor was wide screen with full HD we selected 31. You should choose what the native resolution of your monitor is. If you are using your Raspberry Pi as a headless box (you might not want a monitor and keyboard attached to it), the system defaults to low resolution. You will therefore need to force HDMI output mode even if no HDMI monitor is detected. Raspberry Pi 2 has 1 GB of RAM and you can tell it to split the RAM between running programs (system) and how much is to be used by the GPU. The amount of RAM required depends on your needs. Default 64MB to the GPU should suit most tasks however it may require more for decoding 1080p HD videos. We recommend you set it at 128. This will improve overall performance of the device when running a NoMachine remote desktop session. Enter option 8 - "Advanced Options"
Enter option 2 - "Memory Split"
We'd love to know how you are using your Raspberry Pi with NoMachine!